Last Thursday morning, I took my chem final. After three hours and fourteen problems, I came home and promptly baked the following skillet cake for myself. That I was desperately in need of dessert therapy, unfortunately, says a lot about that test and how it went. 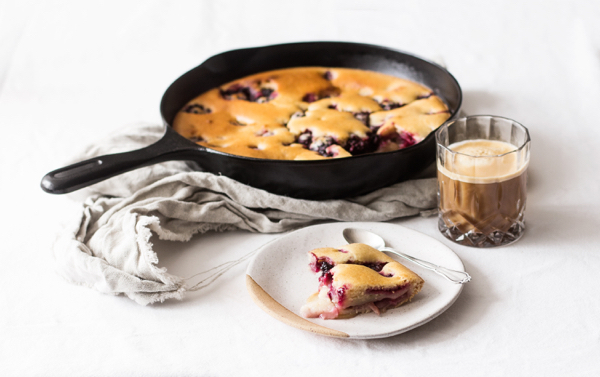 But the good news is that I’ve clearly come to love baking, and this summery peach and blackberry skillet cake is the latest evidence. This is a strange marriage of cobbler and upside down cake. (I say this without every having made either a proper cobbler or a proper upside down cake.) It’s like a cobbler in that the fruit is on the bottom, not the top. 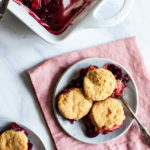 It’s like an upside down cake in that it’s cakey, rather than biscuit-like, but it probably has less rise than a traditional upside down cake, and of course it’s baked in a skillet, rather than a pan or mold. I should probably stop trying to find a way to sum up what this cake is, except to say that it’s delicious. And it’s beautiful, along with being a perfect vehicle for summer produce. 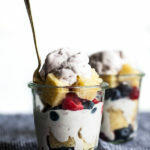 The next time you take an exam that doesn’t go your way, or encounter any other of life’s little vicissitudes, give this peculiar hybrid of a summer dessert a chance. Preheat oven to 350F. Place all fruit on the bottom of an oiled, 12-inch cast iron skillet. Whisk together flour, baking powder, and salt. Make a well in the center and add the almond milk, oil, applesauce, sugar, and vanilla. Mix to combine. Pour the cake batter over the fruit. Place the skillet into the oven and bake for 35-45 minutes, until golden brown on top. Let cool as much as possible before cutting into wedges and serving. The fruit on the bottom will be bubbly and warm. Enjoy! The cake is particularly good with some of my raw whipped cream! On that note, I’m off for the day. I’m sorry that this week has been a lot of brief posts, but the good news is that an August break is now on the horizon, so more recipes and musings are to come. Have a good one! Wow, that looks amazing! I never bake, need to make this though! I love the fact that I already have all the ingredients on that list! Hurrah! i literally just gasped at how beautiful the change-up came out… goes to show the things that i look forward to every day. and that cake looks AMAZING- it will be in my oven within the hour. you never cease to amaze me, gena! Omg. I’m obsessed it’s fine. Also I LOVE the new layout!!! Everyone’s getting bloggy facelifts and I’m diggin yours! Hmmm, suddenly feel like I need a cast iron skillet! I think your posts have been great! Sometimes shorter is sweeter. Espeiclaly when it involves skillet cake!!! WOW, that looks soooo good! And it vegan, one pan, and a dessert. I am all over it! 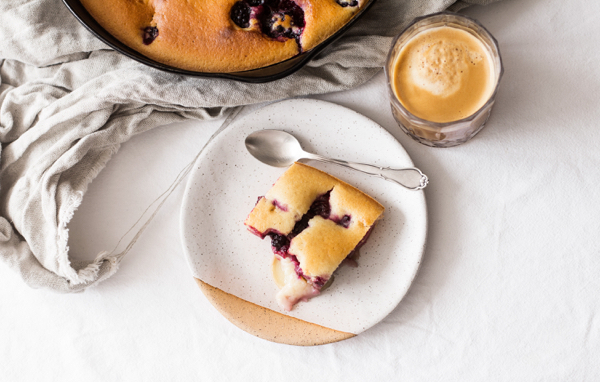 It actually reminds me, a bit, of this mixed berry clafoutis that I made about 6 weeks ago. Basically you make an almost pancake-like batter, pour it over fruit, and bake it. Except it contains eggs and cream (you could swap out for flax and almond milk) but same concept…one skillet/pan and fruit and baking. I love desserts. And I love easy recipes. Thanks for sharing this! Love the new look! And this cake looks delish! This hybrid cake looks amazing! Baking always gets me feeling good after a tough or stressful day. 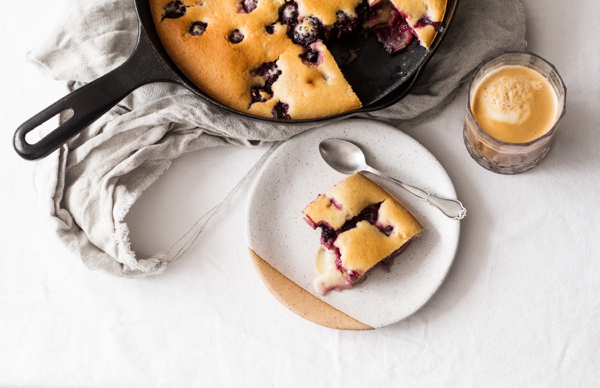 I use my skillet for almost everything…desserts are something I’ve yet to try! Yum–this looks like such a great dessert! mmm this looks like a vegan clafoutis of sorts! either way, this omni would enjoy eating that with raw cashew creme! that looks amazing! I did a double take when I saw this picture in my google reader. I’m not used to seeing baked goods under Choosing Raw! I’m moving to NYC tomorrow. I’m excited and a little nervous. I like fruit, and I like desserts–but I’m not always a fan of fruit in my dessert. That being said, I might have to make an exception. This looks way too delicious to pass up! Apparently I need a skillet! This just wouldn’t look as fun it if was in a regular pan. And I wouldn’t even think of leaving out the raw whipping cream! blog, I check it every other day! I hope Gena doesn’t mind me responding to you but I wanted to help. There can be a multitude of reasons for what you’re experiencing and without knowing more I couldn’t say for sure, but these are classic symptoms of mineral deficiency. If you eating very green raw foods this may mean you also have poor nutrient absorption and thus digestive imbalances to correct. Ive also seen this happen when people are on high fruit diets. Hope that helps! This looks amazing! Would also be great with raspberries or even blueberries. Can’t wait to try it. 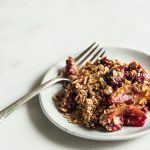 Gena I don’t think you understand how much I love cobblers and how much this just rocked my world…I’m so excited that all of these ingredients are in my cupboard and that I can whip one up on a whim! Looks delicious Gena! I had made a skillet cake before – ok – a really long time ago and remember it coming out and enjoying! now seeing yours makes me want to go and bake one now 🙂 I know you are super busy lately but just wanted to say hi and that Michelle and I are thinking of ya. We hope all is well in DC! Congratulations on getting through chem! And I’m loving that skillet cake. And don’t apologize! You’re a hard-worker. I never comment on anything, but I’ve been following your blog for a while and I think you have the best raw blog out there. Your recipes are always simple and delicious and your site is so well organized and appealing for someone who is borderline ADD. 🙂 Thanks for doing what you do so well! AND, this recipe looks delicious, but the way! I was planning to buy a cast iron skillet and I will DEFINITELY be making this recipe! I usually don’t like cooked peaches, but that looks really good. 🙂 And I seriously love all of your posts! This looks seriously delish! I love the combo of berries and peaches! Yum! Wow that looks delicious! I’m going to have to make it. 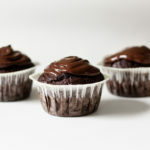 I love to bake….I wonder if I’ll be able to find time with a new baby??? I’m going to have to find time for sure! Thanks for the recipe! Thank you for sharing recopies and information. Each time I read your blog and article mentioned, it helps me to stay on track and stay motivated. This is not just weight loss, it is also life style. Your blog helped me and my family to stay motivated on stay on track. This looks gorgeous and delicious, I can’t wait to try it. I haven’t gotten into baking since going vegan, but I can see myself doing it more for winter. 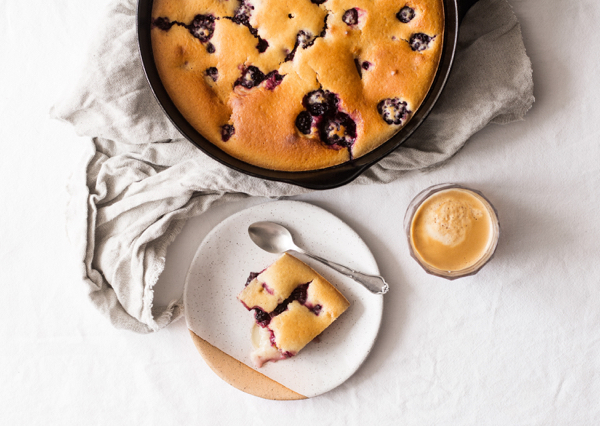 I love peach and blueberry cobbler so I’m sure I’d love this skillet cake as well! Once our new kitchen is done, I will have to make it….. or you could invite me over and make it for me! 😉 Kidding, of course! By the way, the new blog layout is beautiful! Simple and clean but pleasing to look at. Have fun in NYC! WOW! I think I might try and just use a bit of stevia in place of the sugar. This looks beautiful! And love the sound of “skillet cake”. To me it means I don’t have to worry about a “shape” or frosting! I want to make this today and I get why the skillet would make it amazing….. and wondering since I don’t have a skillet right now could I make this in a ceramic tart dish? please respond asap if you are available. Thanks, love your blog! This looks amazing! I have been noticing people are using applesauce in many vegan recipes, must try this out. Gena, This is a great dessert.